William came from a family of tailors. His grandfather was a merchant tailor and his father was a tailor’s cutter. Perhaps inevitably, William also learned the family trade and became a journeyman tailor. It was this skill that led to his enlistment in the Royal Flying Corps, helping to maintain the fabric-covered bi-planes of WWI. William’s parents, Thomas Jewers, born c1857 in Lowick, and Mary Johnstone Grey, married in August 1876. William was born in 1877 at Seghil, about seven miles north-east of Newcastle. He was the eldest of about 16 children born between 1877 and 1899. In order of birth, his siblings were Ethel, Sarah, twins Ada and Barbara, Thomas, Charles, John Headley, Percy, Frederick, Elizabeth, twins Nellie and Nora, Doris, Joseph and Stephen. In the 1891 census, Thomas and Mary were living at 36 Gainsborough Green, Elswick, Newcastle-on-Tyne with their first nine children. By 1901 the family was in Portsmouth, and they had another seven mouths to feed. On the night of the 1901 census neither William nor his father were at home. Three of the eldest children, Ethel, Sarah and Thomas, were all following the family tradition and working as tailors. William, then in his twenties, was working away from home as a coat-maker and tailor. On the night of the 1901 census, he was in Essex, boarding with George Rann, a tailor’s trimmer, and his wife and two children, at 81 Ramsay Road, Cann Hall, at the southernmost tip of Epping Forest. A few years later, in 1904, William’s father, Thomas, died aged just 47. His death was registered in Newcastle-upon-Tyne. His mother, Mary Johnstone Jewers, died in 1908, aged 51. The youngest of her children would have been just nine. William seems to have remained down south. He married Amelia Dorothy Airey in Winchester in 1909. Amelia Dorothy was born in 1884 in Guildford. By 1911, William and Dorothy were living at 3 Gardener’s Cottage, Clewer. William was making a living as a tailor and the census recorded the sad information that they had had one child, William, who had died in 1910 before his first birthday. They went on to have at least two more children who did survive, Dorothy born in 1912 whose birth was registered in Windsor, and Robert Thomas whose birth was registered in Eton in 1914. William became Flight Sergeant 5838 in the Royal Flying Corps at 1st Aircraft Depot at St Omer. He arrived in France on 19 July 1915. The main role of the Aircraft Depot was to receive, repair and dispatch aircraft and associated equipment, providing the squadrons with additional support in the field. According to the First World War Aviation Historical Society website, the Aircraft Park, as it was then known, arrived in Boulogne in August 1914. During the early stages of the war, its location was frequently changed but by October 1914 it had moved to St Omer and there it remained for nearly four years. The role of the Aircraft Park was to repair everything from aircraft to vehicles and equipment, right down to the lawnmowers used for cutting grass on the aerodromes. To cope with the size of the task, another park was established at Candas to look after the squadrons to the south. 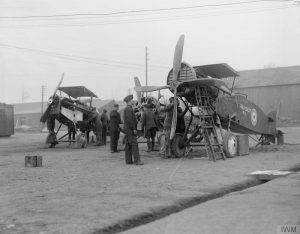 By the end of 1915, it was decided to make St Omer and Candas fixed depots and to create three new air parks to provide mobile support to the squadrons. St Omer was renamed No 1 Aircraft Depot, and Candas No 2. The image, left, taken by Second Lieutenant David McLellan (Photograph Q 11963 from the collections of the Imperial War Museum) shows the reassembly of aircraft at No. 1 Aircraft Depot at St. Omer on 19 December 1917. The plane on the right is a Bristol Fighter and that on the left is an Royal Aircraft Factory S.E.5 single-seat fighter biplane. The engines of both are being tested. When William arrived in France in July 1915, the Depot at St Omer comprised around 1000 technical personnel. It looked after repairs and stores, holding about three month’s stock of aeronautical and transport supplies. As well as issuing new aircraft to the front line, it maintained an attrition reserve, and overhauled and reconstructed aircraft, balloons and vehicles. 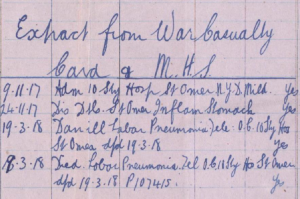 Possibly due to stress caused by the pressure of work, William was admitted to hospital in St Omer in November 1917 and diagnosed with inflammation of the stomach. 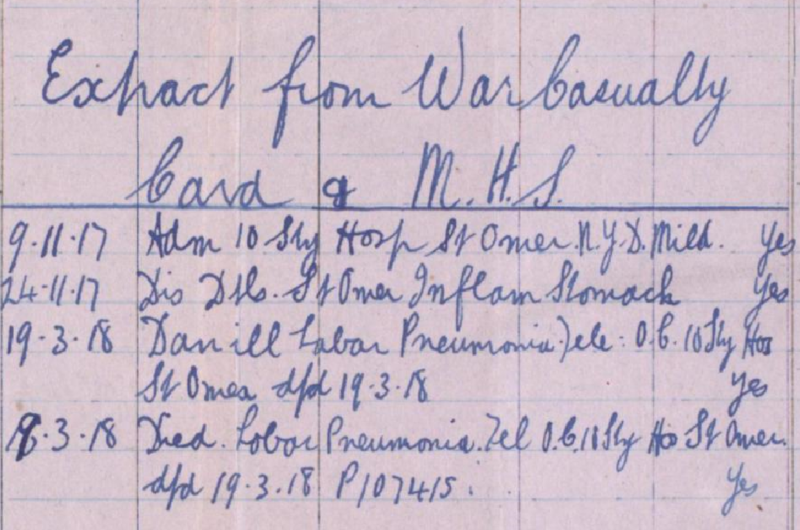 Details from his War Casualty Card are shown in the image, left. He contracted pneumonia the following Spring and died in hospital on 19 March 1918, age 40. 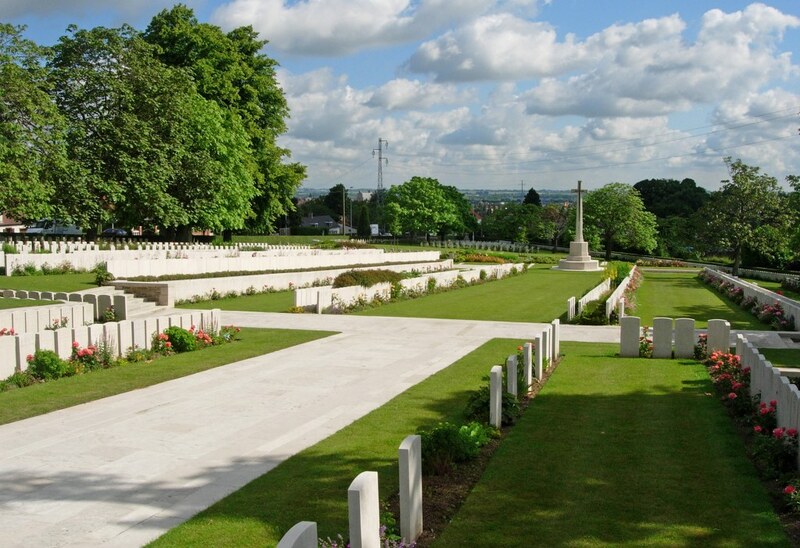 He was buried at Longueness (St Omer) Souvenir Cemetery, Pas de Calais, in section IV.F.73. In the cemetery records, his wife’s address is given as 24 Ditton Road, which is now number 44. In Marshall’s local directory for 1916, there is no name given next to the listing for 24 Ditton Road so it’s not clear when they moved to Datchet. In this image, left, from the Commonwealth War Graves Commission, William’s gravestone is in the first row to the right of the cross, facing onto the central lawn area. He was awarded the British War and Victory Medals and 1915 Star. He is also remembered on the WWI memorial on Datchet’s village green.